Travelers these days thirst for ‘positive experiences’ and want to take home fond memories of authentic local life from their chosen destination; individual moments that set their holiday apart. Malta, an established holiday destination since the ’60s, may not strike you as a place to offer still those special gems of local life. Is it possible then on a holiday of a few days to a couple of weeks maximum to actually ‘live like a local’ in Malta? We argue that it is, and from the first day of your stay, if you know what to look for. 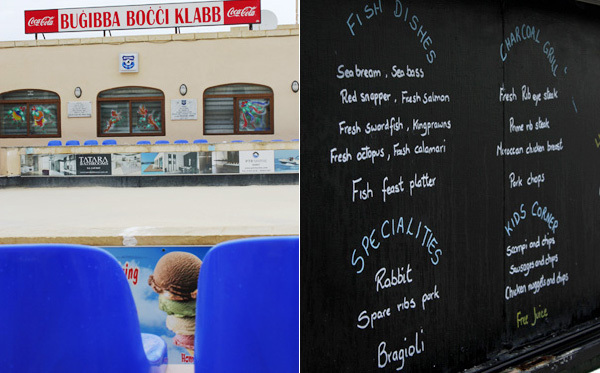 Just take note of the everyday routines of the Maltese islanders. No need even to seek out or coincide with our high days, holidays or events like festas. A truly insider look at local life on Malta and Gozo isn’t the preserve of the exclusive ‘cultural’ holiday either. As they say, some of the best things in life come for free! So if you’re opting for a cheap holiday and the ease and convenience of deals offered online by companies like First Choice, you’ll won’t need to factor in much spending money to enjoy some of the richer experiences Malta has to offer. Here’s our round-up of local experiences for both the first-time and repeat traveler; five simple, cheap ways to discover, and participate in, authentic slices of Maltese life. 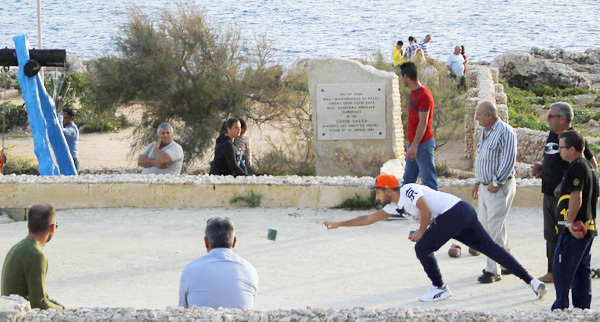 Boċċi is a game of Mediterranean bowls – similar to French ‘boules’ – that you’ll find played across Malta and Gozo. A pitch you’re bound to come across is on the main Bugibba seafront promenade, but hunt out other clubs that are hidden away in villages and town back streets or pop up in local beauty spots like this one above at Ghar Lapsi. 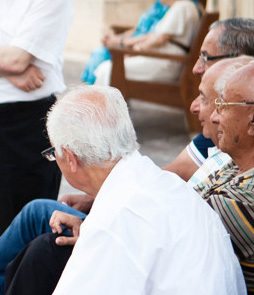 The Maltese version of the game uses ‘pellets’ or cylinder-shaped boules and it’s thought to date back to the time of the Knights of St John. Head to the Bugibba pitch, chat with the teams and before you know it, you’ll be thrust forward to ‘have a go’! Lots of spectator seats at Bugibba too, if you don’t fancy your hand at it, or worry about ‘letting the team’ down. With names like ‘The King’s Own’, who wouldn’t be curious about Malta’s Band Clubs! While they do indeed play home to brass bands, they are more like community centres where local life is played out. Each village and town has at least two band clubs (Valletta, with its many parishes, has far more). Often rivals in musical prowess and on account of their traditional (dare we say) political party affiliations, band clubs are objects of local pride even in modern-day Malta. Pop in for a drink in the bar of a band club – don’t expect fancy decor – and pass the time with its members and regulars. Band Clubs often offer some superb cheap eats of local dishes, so check their menus too. Winter or summer, come late afternoon til sundown, you’ll notice benches in town and village squares start filling up. 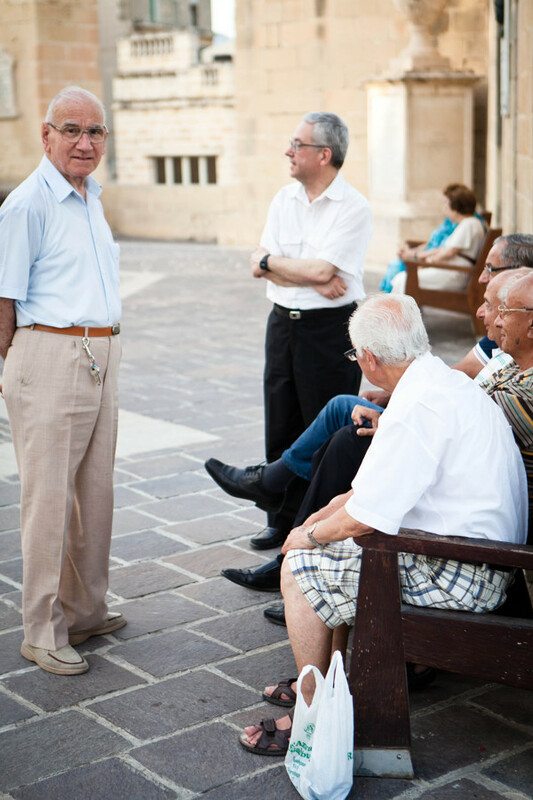 Usually, it’s the older, retired men who frequent the square (pjazza) to meet mates and chat the remains of the day away. Women are busy shopping or getting supper! Choose a suitable bench, wait for some ‘movement’ and before long, you’ll be in the midst of animated conversation – and probably be drawn in to chat too. If the chat is in Maltese only, don’t worry, you’ll just need some skill at Charades! It’s an age-old scene that has taken place every day for centuries. A slice of living history to watch or take part in. This is a very popular activity for Lycra-clad locals and expats alike. And where better to get fit than on holiday in the Mediterranean? Find a suitably long seafront such as the Gzira to St Julian’s stretch passing by Sliema, or head to Bugibba, Marsascala or Zurrieq seafronts and get some air in your lungs at a pace to suit. Start at crack of dawn in peak summer months or you’ll expire, but winter is the perfect climate for power walking or jogging. Of course, if you don’t meet your personal best time, you can chill out en route at the many cafes if you opt for more urban seafronts. The Zurrieq headland is worth visiting for some amazing sea views and its rural location. Once you’ve power walked or jogged, you’ll have earned your right to the ultimate local Maltese savoury snack – pastizzi! At their best, they come straight from the oven on old metal trays, their flaky pastry crisp and their centres of mushy peas or ricotta melting in the mouth. Crystal Palace bar on the outskirts of Rabat near the car park is one of the more famous pastizzi eateries and open nearly 24/7 with a brief few closing hours over night. Join the locals sipping tea and coffee in glass tumblers and don’t worry about leaving a heap of pastry crumbs all over the floor!